There aren't many differences between versions of Mighty Final Fight aside from the odd one below. However, stuff I can't show in screens is the fact that two of the bosses were renamed. In the Japanese version, the boss of the first round is called Damnd. His name was changed to Thrasher for the American version. The boss of round 2 is called Sodom in the Japanese version. He was renamed Katana for the American version. 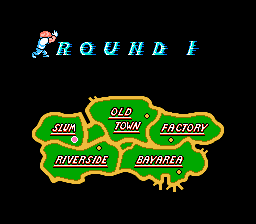 "Harbor Town" in the Japanese version was renamed "Old Town" in the American version.